Posted 20th April 2017 & filed under Blog, Energy, Environment, Intergenerational Justice. 2016 witnessed the largest-ever amount of new renewable energy capacity installation around the world, according to the annual update produced by the International Renewable Energy Agency (IRENA). Are we getting closer to a world powered by renewables? Stewardship of the environment is one of the most prominent examples of an intergenerational contract; each generation receives the natural environment that previous generations bequeathed to them, and passes it on to the next generation in turn. Unfortunately, virtually all the evidence suggests that recent generations have done a poor job of safeguarding the natural environment for their children and grandchildren to enjoy. Fossil fuels degrade the inheritance of future generations in two ways, firstly by placing the health of future generations at risk from extreme weather events and natural disasters that are caused by climate change, and secondly through the damage which is done to the natural environments where fossil fuels are extracted from in the first place. That is why the transition towards renewable energy is so important to the realisation of intergenerational justice. In this context, the data from IRENA strike a positive note. 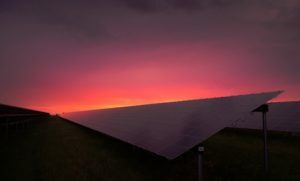 They show that global renewable energy production capacity has now crossed the 2,000 Gigawatt (GW) threshold, having been assessed at 2,006 in 2015, a growth of 8.7% compared to the year before. The leading source of this new renewable energy was solar, which saw 71GW being added, in addition to 51GW of wind, 30GW of hydropower and 9GW of bioenergy. This impressive growth builds on the long-term trend which has seen total renewable energy generating capacity around the world grow from 989GW as recently as 2009 to more than double that total in just six years. Something that may seem surprising to some observers is that Asia is the continent that has both the largest amount of installed renewable energy generating capacity and also the one where it is growing most quickly. The data show that Asia accounted for 58% of the global increase in 2016, bringing the region’s total to 812GW – almost half of the planet’s total. One of the main drivers of this trend is China’s enthusiasm for solar energy; last year China opened the world’s largest solar farm on the Tibetan plateau. However, even in Africa – where the total amount of electricity (from all sources) generated by the 48 countries that make up sub-Saharan Africa is about the same as the amount generated in Spain – 4.1GW were successfully added last year, bringing the regional total to 38GW. Given that regions which are, in aggregate, much poorer than the developed West are accelerating ahead of us in terms of their renewable energy deployments, there is clearly still much more that we could do to protect the interests of future generations.